Use your Key Ingredient account and mobile apps to create and add recipes to your collection. The Key Ingredient Recipe Reader syncs seamlessly with your Key Ingredient account and lets you bring your collection with you into the kitchen. With several, easy to use features, the Recipe Reader is the kitchen companion on home cook should be without. It's the perfect gift for mom or grandma! Keep all of your favorite recipes, and thousands of recipes can sync seamlessly from your Key Ingredient account. Quickly and easily find the recipe you are looking for. Add your choice recipes to your planner and flip through them easily while cooking that big meal! 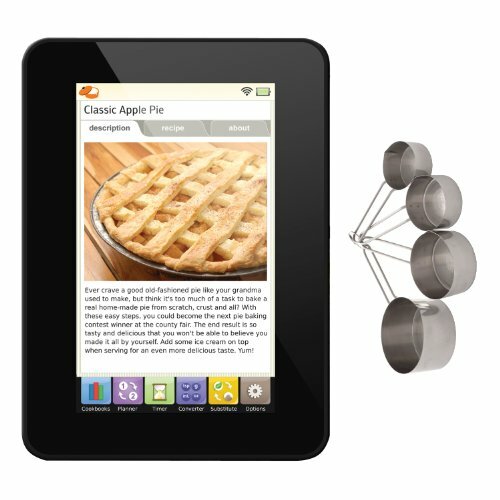 With a built-in stand, the Recipe Reader is designed to be hands free. Stand it upright or lay it down for easy reading while you're mixing or chopping. The screen rotates automatically.